Archive for iDOLM@STER, THE, Cinderella Girls. A catgirl doing cat things. If you know anything about anime, then you're at least aware catgirls are a common fetish, and may even be familiar with the various controversies surrounding them. Are they furries? What if their paws and tails are real? Should they also have human ears in addition to their cat ears? This entry casually compares the catgirls in Isuca and The iDOLMASTER Cinderella Girls as an excuse to introduce these Winter 2015 shows and to revisit some of my grievances regarding catgirls. Ayako Boat needs more lines. 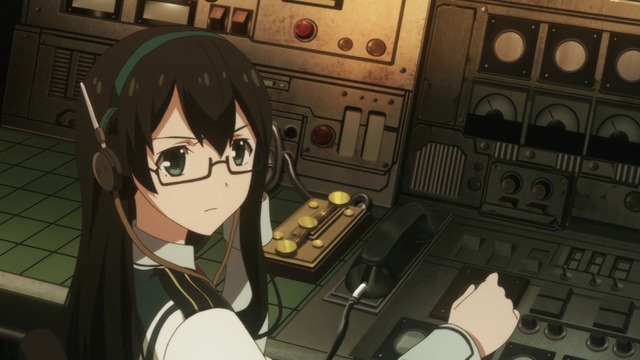 I enjoy both Kantai Collection and The iDOLM@STER Cinderella Girls, and I still look forward to the new episodes each week, but neither show is particularly successful at getting me invested in the characters. This is surely because both shows are adaptations of already successful games and are intended to cater to established fans. However, this means cramming both shows with simply too many characters that never get developed. They end up existing simply as catchphrase-spouting bits of scenery. Pages and pages of idols. There are entirely too many Cinderella Girls. 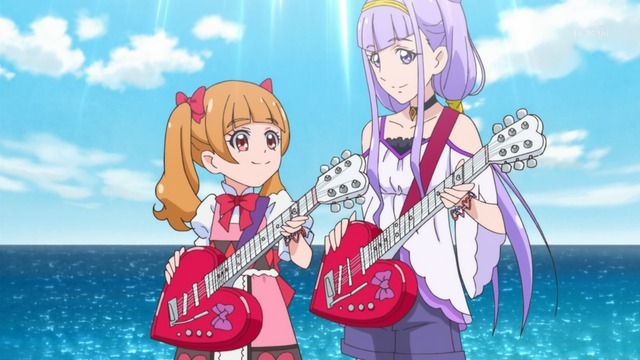 It wasn't a problem during the first cour when it appeared the show was content with keeping the story on the 14 main idols; that worked for its two-cour predecessor. 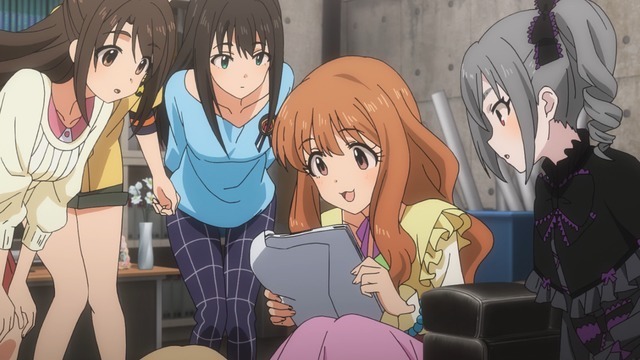 However, the current season of THE iDOLM@STER Cinderella Girls seems intent on cramming more and more of the game's enormous battery of idols into the anime, presumably attempting to placate ardent fans of niche characters with cameos. Unfortunately, this practice dilutes the show as a whole, making this half of the Cinderella Girls anime somewhat underwhelming. 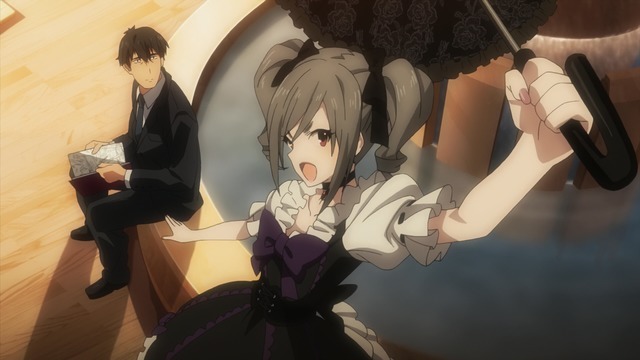 I want to read Ranko's "grimoire." Chuunibyou has changed. I supposed technically it's evolved. Or perhaps ascended to a higher plane. If you associate chuunibyou with its roots, it's apparent the term's meaning had already transformed beyond its original usage by the time it started appearing prominently in anime. Nonetheless, when I say it has changed, I'm referring more generally regarding how chuuni characters themselves have appeared within anime over time. Kaede is also the same age as Mikuri. 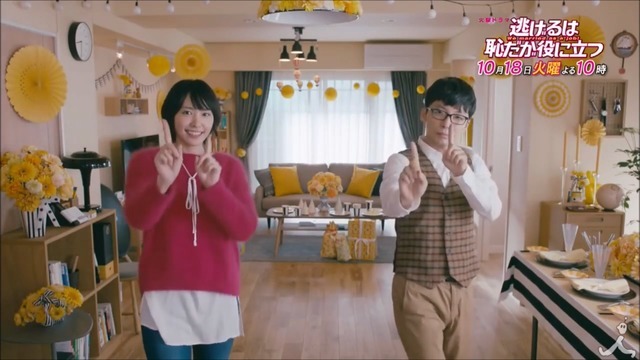 I started watching Nigeru wa Haji da ga Yaku ni Tatsu (literally, Running Away Is Shameful But Helpful, but officially, We Married As a Job!) 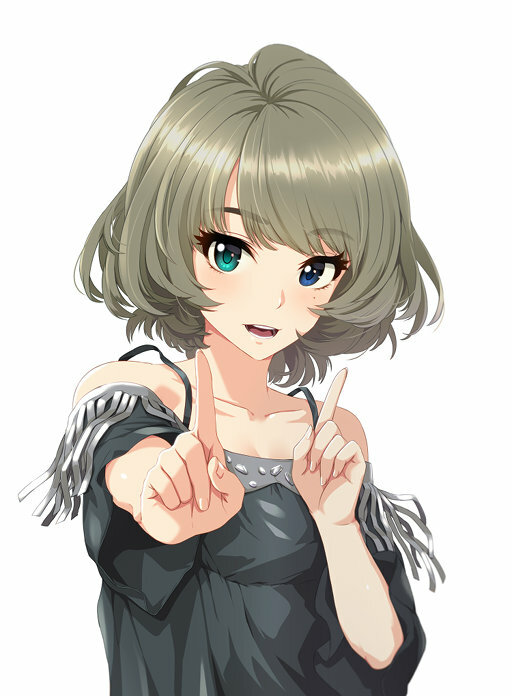 because of the above piece of fan art of Kaede posing curiously. It was obviously a reference to something, but I wasn't familiar with its origin. Thankfully, the Twitter pointed me towards the JDrama source. That is a lot of yellow. Since this occurred during the downtime between anime seasons, I figured I'd give the show a try. I'm not quite halfway through its 11 hour-long episodes, but it seems pretty good so far. The production values do have that sort of home video lighting which seems characteristic of Asian television shows. The male lead also seems unusually staid for a man in his thirties. I'm not sure if this is because the show is based on a manga, or if he's supposed to represent a caricature of the so-called "herbivorous" man, or if people like him actually are fairly common in modern Japan. In any case, the cast is good, not overly large, and there are no school-aged spazzes in sight—at least, not so far. The matching guitars are actually magic beam rifles. This is not a joke. Seven or eight of the shows I plan to watch during the Summer 2018 anime season are shows continuing from Spring 2018 or sequels. Specifically, Overlord III, One Room 2, and Cinderella Girls Gekijou 3rd Season are sequels, and the shows continuing from last season are Detective Conan, GeGeGe no Kitarou, Major 2nd, Hugtto! Precure, and possibly Piano no Mori.